To act as a resource of information regarding homophobia, heterosexism, transphobia and LGBTQ issues on the WU campus and the surrounding Washburn community. 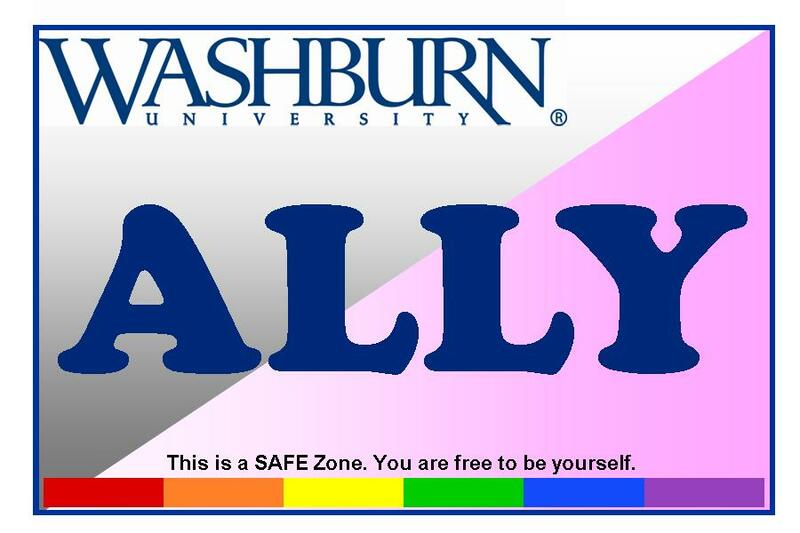 Ally Safe Zone Basic Training: Washburn Faculty, Staff and Students have the opportunity to learn and experience current, relevant, and necessary information regarding awareness, safety, and available resources for our lesbian, gay, bisexual, transgender and questioning students. After the completion of a 3 hour Basic Training session, participants have the opportunity to become a Washburn Ally, declaring their office to be a Safe Zone. Beyond the Basics -The purpose of Beyond the Basics is to continue the dialogue and learning opportunities for Washburn Allies. It is recommended but not required that participants attend an Ally Safe Zone training prior to attending a Beyond the Basics program. To register for an Ally Safe Zone Basic Training or a Beyond the Basics event please email getalife@washburn.edu.